After the border with Spain moved south to the Pyrenees, Carcassonne lost its strategic position, and it was abandoned. 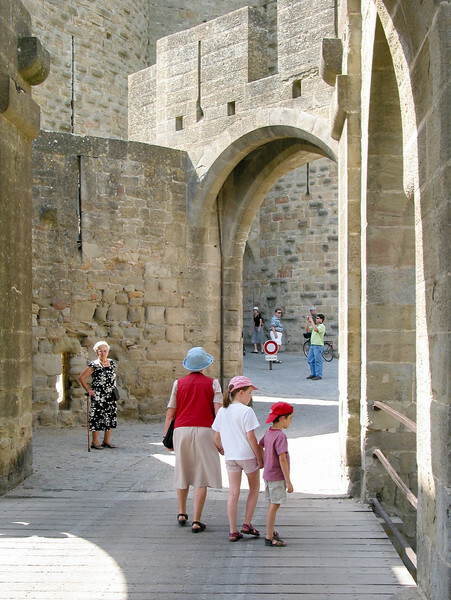 The 19th-century Romantic movement renewed interest in such monuments, and the architect Viollet-le-Duc directed the restoration of the medieval walled town and castle. But his work is somewhat controversial today, since his imagination drove some of the present details, such as the pointy tower roofs. Today only a hundred-odd people actually live within the walls, and it's quite touristy. But great fun!